A prime location across from the bay and boardwalk delicious free breakfast and an indoor pool and hot tub are just a few of the reasons to book the Best Western Holiday Hotel. Each of this two-story property's 83 rooms includes a microwave refrigerator coffeemaker premium cable channels and free local calls; some rooms include a jetted tub and most rooms are non-smoking. Stay on budget with a free hot breakfast buffet each morning. Wi-Fi keeps you in the loop and the exercise room helps you stay fit. 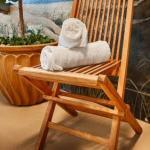 Sample the indoor pool and hot tub for some rest and relaxation. The front desk is open 24 hours and parking is free.Located on the scenic Oregon Coast Highway (Route 101) the Best Western is on the water adjacent to the Coos Bay Boardwalk. Southwest Oregon Regional Airport is five miles away. The hotel is two blocks from the International Port of Coos Bay and four blocks from the Coos Art Museum. Drive 30 minutes to the Pacific Ocean at Cape Arago State Park. Drive 50 minutes north to ride a dune buggy in Oregon Dunes National Recreation Area. Eugene Airport is 105 miles north.